This 1910 photograph shows the Superior Coal and Improvement Co.’s Climax locomotive that was used to haul coal from the mines south of Goode’s Corner to a connector with the Northern Pacific Railroad. The connection was located near what is now the intersection between Rainier and Gilman Boulevards. 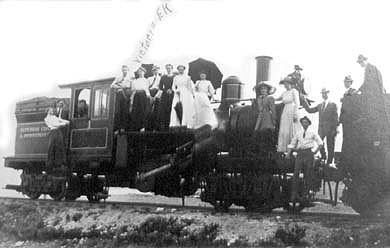 As someone has observed in hand writing over time, Victoria Ek is standing second from the left in front of the engineer’s cab. Ek was the city’s treasurer in 191.